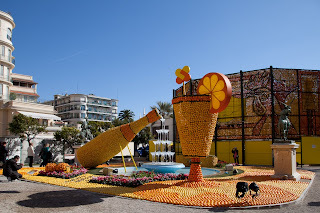 Menton Daily Photo: Fête du Citron - Champagne! A metal frame is constructed for each exhibit and then it's covered in wire netting and then each lemon or orange is fixed to the wire with a rubber band. It takes a long time. 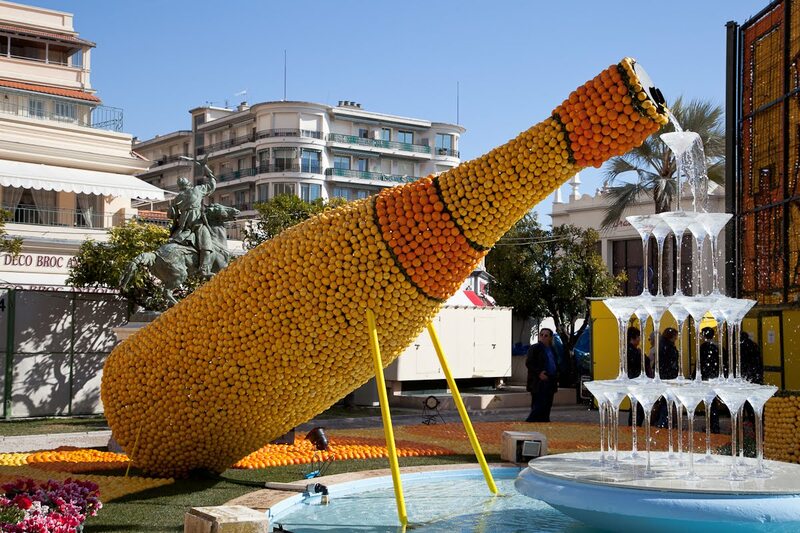 This year 182 tons of fruit have been used - that's nearly 1 million lemons and oranges. Une armature métallique est construite pour chaque pièce , elle est couverte de grillage et ensuite chaque citron ou d'orange est fixé sur le fil avec un élastique . Cela prend beaucoup de temps . Cette année 182 tonnes de fruits ont été utilisées - c'est près de 1 million de citrons et d'oranges. Oh, wonderful! Once in Seattle I had a citrus/champagne cocktail in a French restaurant....a brunch there...wasn't bad at ll. chaque année c'est plus original, superbe idée cette bouteille de champagne avec cette cascade. One million lemons and oranges!! Fortunatley (hopefully) there are plenty left to be consumed! Peter, they are imported from Spain because the Menton lemon is too precious and too expensive! It's now got or getting... a seal of approval, like wine. Is it that time of the year again! 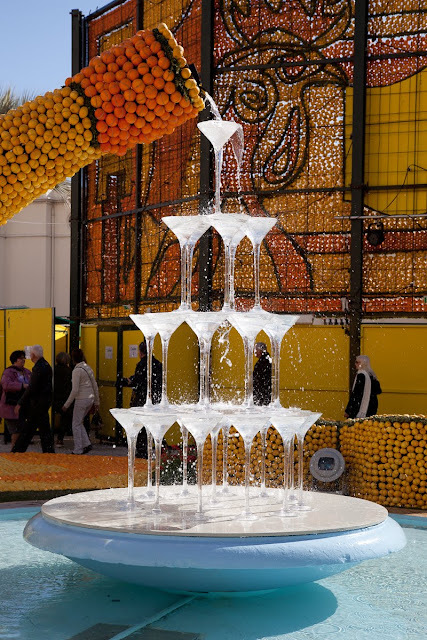 They have outdone themselves with the Citron Fountain! Fantastic idea, and perfect for the theme. Mimosas are very popular at brunch here. It looks like a heap of fun. Enjoy! Unbelievable Jilly, I love that it even has sound effects!! I had no idea there were sound effects too. I hope they stop at night, the neighbours will go nuts if they hear champagne corks pop all night long ! Glad to see that most of the exhibit is lemon, even if they must come from Spain. In years past, the proportion of oranges was so great, it did not seem like a lemon festival. Always fun to see these scenes every year. Amazing what they can come up with. What a great festival! I love to see the creativity that the float designers show. This is brilliant! The colour and sounds must be wonderful...and what a fantastic way to cheer you all up after the cold. Now, all we need is real champagne! Clever and fun - hard to imagine the painstaking work involved . . .